For the assembly the stripped cable ends are soldered at the contact parts of the T6s plugs. The contact part can be removed completely from the plug's shell. The M4 screw serves as strain relief. 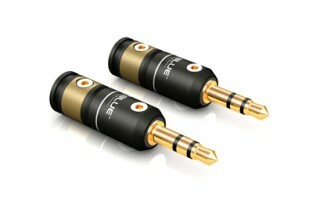 The shell for all plugs (exception: XLR plugs) of the ViaBlue™ T6s series is identical. Only the contact parts change. Flexibly applicable. For all cable diameters. Each T6s plug contains two diameter decreasers which serve for a firm strain relief and centric adjustment of the cables. The small diameter decreaser has an outter diameter of 7.5 mm and an inner diameter of 4.5 mm. Thus cables with an outter diameter of 3 mm up to 4.5 mm can be fixed firmly. The big diameter decreaser has an outter diameter of 9.5 mm and an inner diameter of 7.5 mm. Thus cables with an outter diameter from 5 mm to 7.5 mm can be fixed firmly. Without using any diameter decreaser cables with diameters from 7.5 mm to 9.5 mm can be installed. 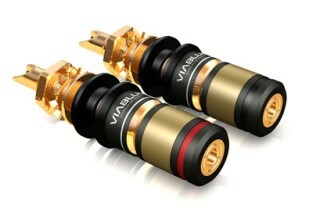 ViaBlue™ T6s spades plug have 24 carat gold-plated contacts. The shells are made of aluminum. Cables up to 9.5 mm diameters can be installed. All connectors of the T6s series are supplied including two diameter decreasers. Those diameter decreasers make an assembly of cables with small and big diameter possible and grant a firm strain relief. 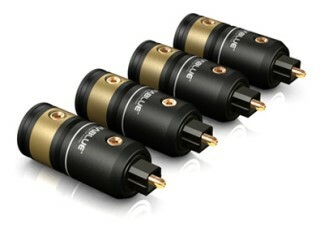 ViaBlue™ T6s flexible pins have 24 gold-plated wires. The shells are made of aluminum. Cables up to 9.5 mm diameters can be installed. 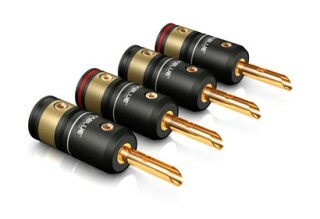 All connectors of the T6s series are supplied including two diameter decreasers. Those diameter decreasers make an assembly of cables with small and big diameter possible and grant a firm strain relief. ViaBlue™ T6s banana contacts serve as replacements for T6s spades contacts or T6s flexible pins contacts mounted on speaker cables. The contacts can exchanged by screwing them in and out. 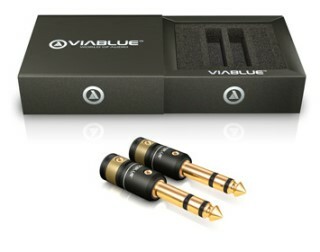 ViaBlue™ T6s banana contacts are 24 karat gold-plated. 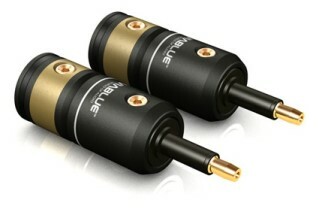 The ViaBlue™ T6s banana contacts can also be used without using T6s shells for direct soldering on wires. 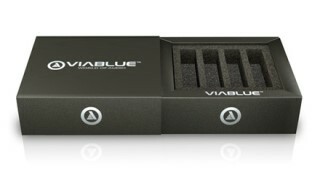 For isolation it's recommended to use ViaBlue™ heat shrinks "Arrow" or ViaBlue™ heat shrinks "Speaker". ViaBlue™ T6s spades contacts serve as replacements for T6s banana contacts or T6s flexible pins contacts mounted on speaker cables. The contacts can exchanged by screwing them in and out. 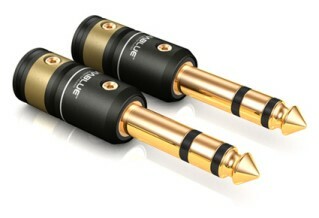 ViaBlue™ T6s spades contacts are 24 karat gold-plated. 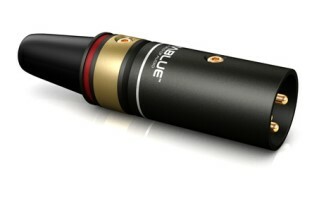 The ViaBlue™ T6s spades contacts can also be used without using T6s shells for direct soldering on wires. For isolation it's recommended to use ViaBlue™ heat shrinks "Arrow" or ViaBlue™ heat shrinks "Speaker". ViaBlue™ T6s rca plugs have contact pins made of bronze which are 24 carat gold-plated. The shells are made of aluminum. Two types are available, a solder and a screw version. The solder version can carry cables up to 9.5 mm diameters and the screw version up to 8.5 mm diameters. The screw version is assemblable completly without soldering. For the assembly the stripped cable ends are soldered at the contact part of the T6s plug. The contact part can be removed completely from the plug's shell. The M4 screw serves as strain relief. With included diameter decreasers all cables from 3-9.5 mm can be assembled and fixed tight in the T6s RCA solder connector. For the assembly the stripped cable ends are screwed in the housing of the T6s solder RCA plug. The conductor is guided by the isolation to the pin and fixed by screw. The screening is turned 360° arround the cable, pressed ahead the isolation and fixed by another screw. Finally, the two outer screws are tightened to fix the shell and hold the cable tight in the connector's housing. Cables with 7-8 mm diameter can be installed. 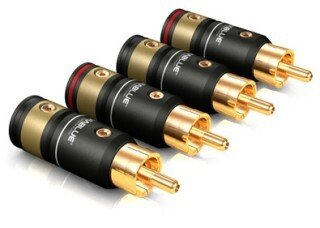 ViaBlue™ T6s rca plugs are 24 carat gold-plated. The shells are made of aluminum. 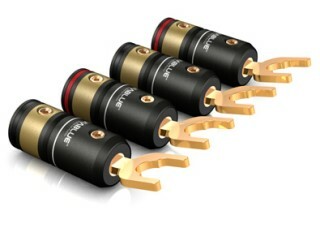 The plugs can carry cables up to 10.5 mm diameters. For the assembly the stripped cable ends are soldered at the contact part of the T6s plug. The contact part can be removed completely from the plug's shell. The M4 screw serves as strain relief. 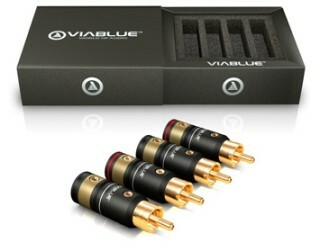 ViaBlue™ T6s rca jacks have contact pins made of bronze which are 24 carat gold-plated. The shells are made of aluminum. Cables up to 9.5 mm diameters can be installed. 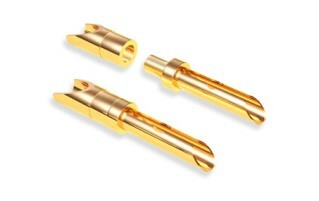 All connectors of the T6s series are supplied including two diameter decreasers. Those diameter decreasers make an assembly of cables with small and big diameter possible and grant a firm strain relief. 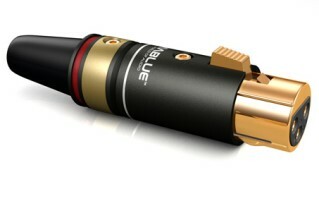 To mount ViaBlue™ toslink plugs on optical toslink cables the stripped ends of the fiber optic cable have to be pushed through the contact part of the T6s toslink plug. 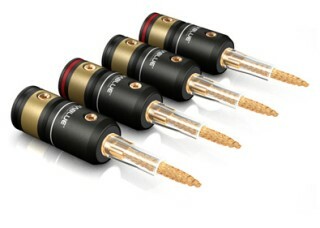 The outstanding optical cable has to be grinded wet and polished smoothly. The contact parts can be removed completely from the plug's shell. The M4 screw serves as strain relief. 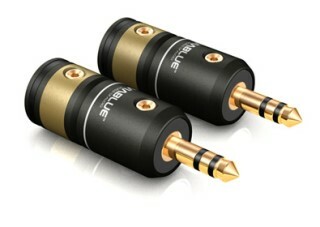 The shell for all plugs (exception: XLR plugs) of the ViaBlue™ T6s series is identical. Only the contact parts change. 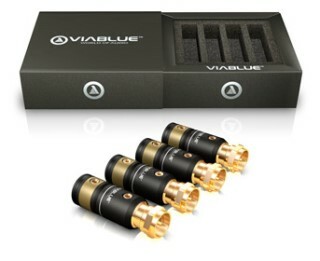 ViaBlue™ T6s mini toslink plugs have 24 carat gold-plated contact pins. The shells are made of aluminum. Cables up to 9.5 mm diameters can be installed. 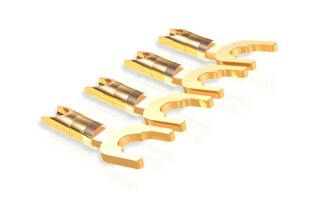 All connectors of the T6s series are supplied including two diameter decreasers. Those diameter decreasers make an assembly of cables with small and big diameter possible and grant a firm strain relief. 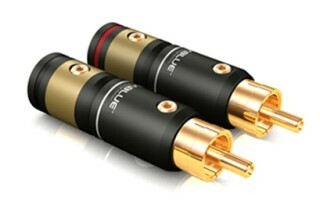 To mount ViaBlue™ mini toslink plugs on optical toslink cables the stripped ends of the fiber optic cable have to be pushed through the contact part of the T6s mini toslink plug. 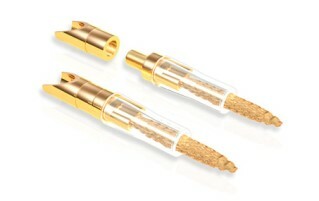 The outstanding optical cable has to be grinded wet and polished smoothly. The contact parts can be removed completely from the plug's shell. The M4 screw serves as strain relief. 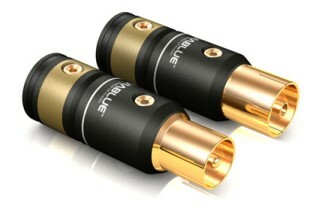 The shell for all plugs (exception: XLR plugs) of the ViaBlue™ T6s series is identical. Only the contact parts change. 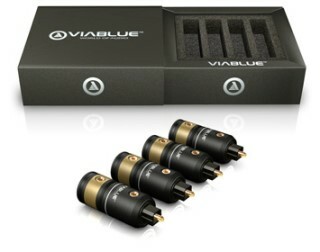 ViaBlue™ T6s phono 3.5 stereo plugs have contact pins made of bronze which are 24 carat gold-plated. The shells are made of aluminum. Cables up to 9.5 mm diameters can be installed. 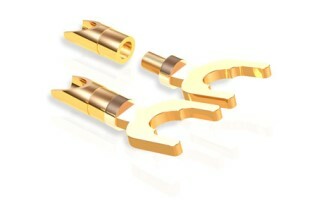 All connectors of the T6s series are supplied including two diameter decreasers. Those diameter decreasers make an assembly of cables with small and big diameter possible and grant a firm strain relief. 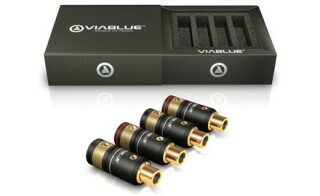 ViaBlue™ T6s phono 6.3 mono plugs have contact pins made of bronze which are 24 carat gold-plated. The shells are made of aluminum. Cables up to 9.5 mm diameters can be installed. 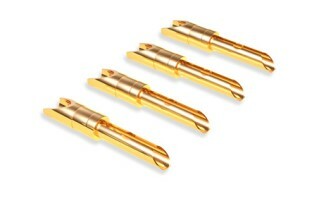 All connectors of the T6s series are supplied including two diameter decreasers. Those diameter decreasers make an assembly of cables with small and big diameter possible and grant a firm strain relief. 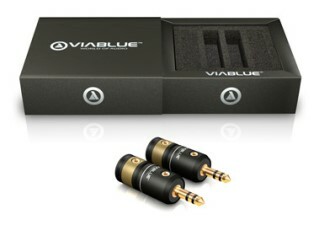 ViaBlue™ T6s phono 6.3 stereo plugs have contact pins made of bronze which are 24 carat gold-plated. The shells are made of aluminum. Cables up to 9.5 mm diameters can be installed. All connectors of the T6s series are supplied including two diameter decreasers. Those diameter decreasers make an assembly of cables with small and big diameter possible and grant a firm strain relief. 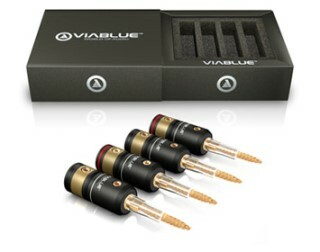 ViaBlue™ T6s XLR plugs have contact pins made of bronze which are 24 carat gold-plated. The shells are made of aluminum. Cables up to 12 mm diameters can be installed. With the gummi break protection cables with 7-8 mm diameter can be installed. 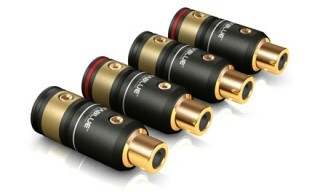 ViaBlue™ T6s XLR jacks have contact pins made of bronze which are 24 carat gold-plated. The shells are made of aluminum. Cables up to 12 mm diameters can be installed. 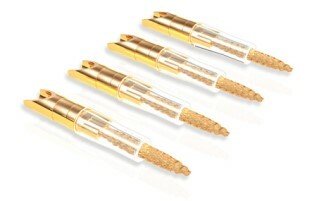 With the gummi break protection cables with 7-8 mm diameter can be installed. ViaBlue T6s Binding posts are 24 carat gold-plated. The housing is made of aluminium. Each T6s Binding posts contains two ViaBlue polyoxymethylene discs for electrical insulation, mechanical pressure sealing and to reduce vibration. To assemble the inner wiring, the stripped ends are soldered or bolted on fine thread web to the rear part of the contact of the T6s Binding posts. The fine threads inside the connector of the T6s Binding posts make it easy to install multiple terminals, and similar types of connections in a row. With the enclosed washers/spring gear ring combination the T6s Binding posts are stably mounted permanently on terminal boards. Through the large contact area for the terminals, connections to the speaker wire can be transferred with minimal resistance. The T6s Binding posts head can be removed completely so the closed cable lugs can be assembled.